A Man Like Me opens with Hunter under extreme pressure to locate Richmond. He tells Meres that he’s offered fifty thousand pounds to any freelancer who can find him, but as yet there’s nothing. Quite why Hunter should be so keen to run him to ground isn’t clear. Richmond did kill Flo in the previous episode, but since she was a fellow Russian agent that can’t be the reason why they want him so badly. Snell suggests using a computer to locate Richmond. Today, of course, that would be the first thing they’d do, but back in the early 1970’s it would have been a much more novel idea. Hunter is initially reluctant – but he eventually appreciates that a computer could cross-check all the available information they have on Richmond (and suggest likely people who would assist him) much quicker than a team of people could. Meres tells Hunter that the FBI computer in Washington could produce half a dozen suspects out of million possibilities in six seconds – although the British computer will take a little longer (a day). Callan keeps fairly quiet during this exchange, although he does close the scene by wondering if human beings are becoming redundant. Hunter and Snell’s visit to the computer, run by the boffin Routledge (Peter Sallis), is an eye-opener. It’s located in the sort of area that’s quite typical for computers of this period – a windowless room packed with shelves of magnetic tapes. Routledge is very proud of Edna (Electronic Distributed Numbers Assessor) although Hunter still remains jaded – his only interaction with computers has been when he receives his bank statements, which is why he’s not confident! Edna eventually spits out a list of nine possible people that Richmond could contact. The one that he’s actually visited is Harris (Robin Ellis). Harris has been a sleeper agent since the mid sixties and this is the first time he’s been called on to do anything. The arrival of Richmond out of the blue is obviously unwelcome, but he has little choice but to obey. Ellis (later the star of Poldark) starts by sporting a lovely tanktop, which, perhaps thankfully, he changes shortly afterwards. Callan’s dislike for computers only increases when Hunter tells him that he’s been named as one of the nine possible contacts. A running theme during the Richmond trilogy is how alike Callan and Richmond are – which is one of the reasons why the computer has linked them together. But to be fair to the computer it did also come up with Harris’ name, although Callan also tracked him down the old-fashioned way (by pounding the streets, asking questions). Callan seems confident that Richmond is holed up in Harris’ house, although the way they attempt to flush him out is odd (to say the least). Firstly, they lure Harris away, drug him, and then bring him back. By the time they return it’s not surprising that Richmond has left – so it’s difficult to understand why they didn’t simply stake-out the house and wait for Richmond to leave. Hunter has a lead – Richmond’s likely to be at a Russian Vodka factory, waiting for a ship to take him out of the country. 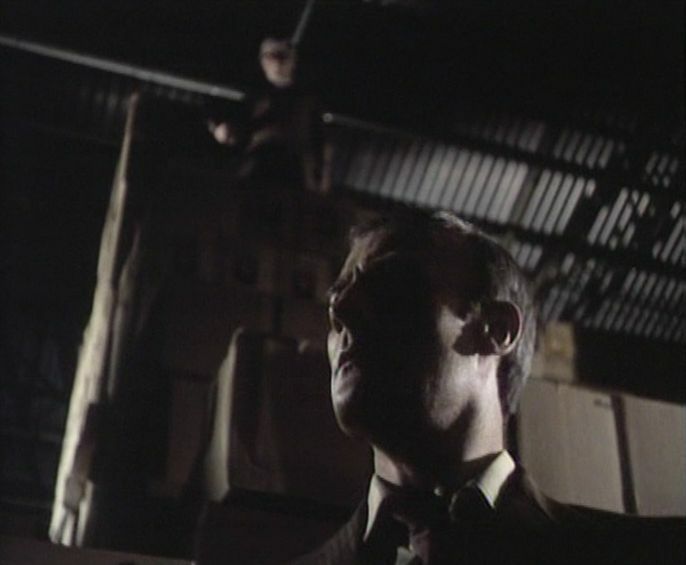 Although the majority of Callan‘s location work was shot on videotape, all of the factory scenes (which take up most of part three) are shot on film and this does help to give the sequences an extra sheen. But it does seem more than a little contrived that Callan has to go to the factory alone (apart from Lonely) since Hunter can’t spare anybody else. It helps to make the final showdown between Callan and Richmond more tense, but it’s a pity that it was set up in a rather artificial way. Callan is a man who rarely shows fear – at the end of If He Can, So Could I he told Lonely how he had to constantly maintain an aura of hardness – but here he does show a twinge before he enters the factory. This scene is notable for Lonely calling Callan by his first name – something he hardly ever did, which demonstrates that Lonely has picked up Callan’s sense of unease. There’s a nice nod to the iconic title sequence as Callan shoots a light-bulb (although it’s not swinging). He then proceeds to stalk Richmond through the factory, eventually shooting him just after Richmond looses off a shot at Lonely. Richmond is still alive, but begs Callan to finish him off – he doesn’t want to end up in Snell’s hands. Callan may be a killer, but he’s always been a reluctant one. To murder somebody in cold blood – and who’s asking to die as well – is clearly hard, but he does it (although he closes his eyes as he pulls the trigger). Woodward and Hunter then share a lovely scene together, in which Lonely decides that after all they’ve been through they’re now pretty much equal – although he still ranks Callan as his friend, indeed the only friend he has. In some ways, this points towards the restructured relationship that we’d see in the comeback episode The Wet Job (1981). Hunter promises to break Callan for deliberately killing Richmond but Callan tells him that he’s too late and walks away. Callan’s future therefore remains uncertain – we’ve seen before how leaving the Section isn’t an option, so it seems inevitable that Hunter will now place him in a Red File. Although A Man Like Me was the final regular episode, it wasn’t quite the end of the story. There would be a film two years later (based on the original Armchair Theatre story A Magnum for Schneider). And in some ways the story does work better as a postscript to the series (since it deals with Callan being brought back into the Section after leaving) as it did when it was a prologue. Alas, the story didn’t end there as in 1981 a one-off television special was broadcast (the aforementioned The Wet Job). Although it was written by Mitchell and starred Woodward and Hunter, it was in so many ways a massive disappointment. It’ll be something that I’ll rewatch in due course, but it seems wrong to do so immediately after the end of A Man Like Me. A Man Like Me offers no happy ending or comfortable closure, just the image of Callan walking out into an uncertain future. Callan is a series that may be superficially dated in certain aspects, but the core themes of deceit and dubious morality remain just as relevant today. Thanks to the magnetic central performance by Edward Woodward and the impressive supporting cast headed by Russell Hunter it’s a programme that’s still so compelling – nearly fifty years after the Armchair Theatre pilot first aired. ← Callan – The Richmond File: Do You Recognise The Woman? Are you ever going to review “Wet Job”? I always thought it was a fairly dull episode with elements ranging from boring (the plot) to oh, my good sweet lord, that’s absolutely horrendous (the incidental music). Some of the actors were pretty good, though, especially Hugh Walters as Hunter. I have this theory that “Wet Job” isn’t a sequel to the series but to the 1974 film. They share certain elements not in the series like Lonely not being able to read or write, the “Hunter & Co. ltd.” building instead of the usual disused school setting and the same folders. Whereas in the series they were plain paper folders that just happened to be in different colours, in the 1974 film and “Wet Job” they are patterned and thick. Also, the character of Callan is slightly mellower and less cynical in the two. What do you think? Yes, I should really bite the bullet and tackle Wet Job. If you ignore the Armchair Theatre pilot, then the film – showing Callan tempted back to the Section for one last job – works quite well as an epilogue to the series. I should also dig out the film for a rewatch prior to Wet Job. I haven’t seen it for quite a while, probably due to rather overdosing on the commercial VHS back in the late eighties when the tv series was pretty much out of circulation. I just watched the Callan film after watching “A Man Like Me” and it does work reasonably well as a post-series film, though the the most glaring problem is that Callan meets Dr. Snell for the first time. The mutually antagonistic yet grudgingly respectful (and occasionally playfull) relationship between Callan and Meres works quite well in the flim if you are aware of the series chracters — you can really believe that both of these men at one point suspected each other of being a traitor (and one shot the other) yet here they are wrestling at ‘work’ like a couple of schoolboys. Meres’ disbelief that Callan might actually have to run the bath a second time to wash his clothes is amusing because he can’t seem to reconcile his colleague’s superior skills with his apparently lower class standard of living.